Internet Safety 101SM: Empowering Parents, we can change these. In the offline world, communities are typically responsible for enforcing norms of privacy and general etiquette. In the online world, new etiquette challenges abound. In order to reap the benefits of socializing and making new friends, teens often disclose information about themselves that would typically be part of an acceptable “getting-to-know-you” process offline (name, school, personal interests, etc.). On social network sites, this kind of information is now posted online—sometimes in full public view. In some cases, this information is innocuous or fake. But in other cases, disclosure reaches a level that is troubling for parents and those concerned about the safety of online teens, and once children put this information online, they will never get it back. 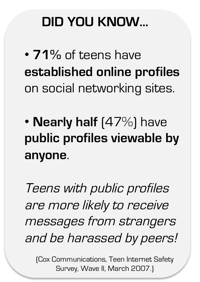 Teens are posting a tremendous amount of information on their online profiles, so it is vitally important that teens use strict privacy settings and are savvy about the individuals they allow to view their social networking profile. Since kids are often trying to catch the attention of and gain approval from their peers, some teens tend to post content to appear popular or to gain a response from others in their online community; teens jockey for status, post risqué pictures, brag about the previous weekend’s adventures, and can easily use this digital space to humiliate others or post inappropriate content.5 No information is truly private in the online world; an online “friend” can forward any information posted on your child’s site in a moment. "Kids are going to post photos and personal information. At least they should be aware of the risks. At least they should use the privacy tools built into the sites to keep people they don't know from accessing their information and their data. And at least moms and dads should learn about what they are doing."